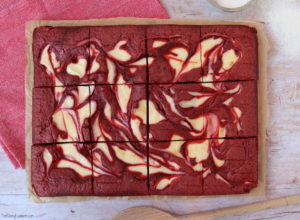 I am a huge fan of cheesecake brownies as they combine two delicious desserts into one even more delicious dessert! 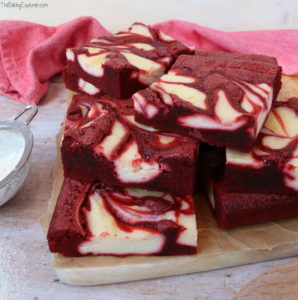 These Red Velvet Cheesecake Brownies combine moist fudgey brownies with creamy vanilla cheesecake. 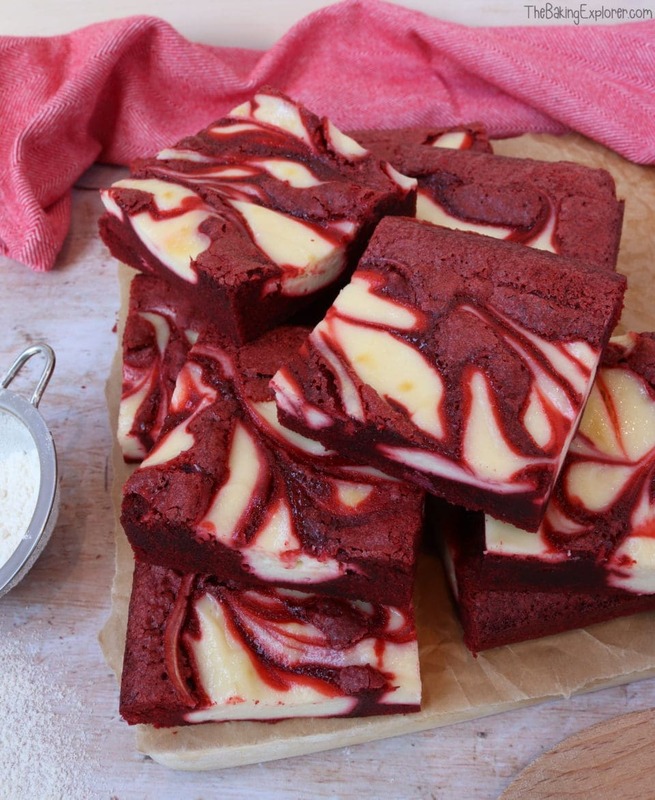 If you like brownies and you like cheesecake, you will love them! 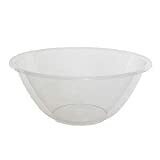 They’re so easy to make too and you need relatively little equipment. The bright red is really eye catching and they would be perfect at a bake sale or for Valentine’s Day! 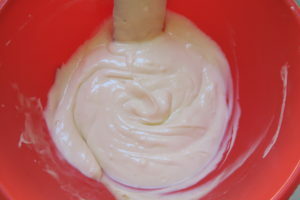 To start, I made the cheesecake filling and set it aside. 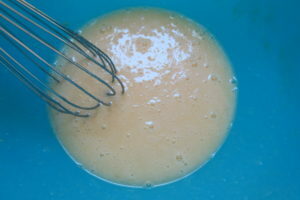 For the brownie batter I first whisked the eggs and sugar together. 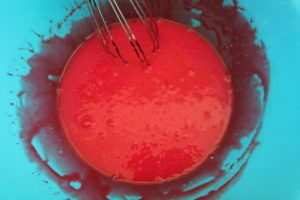 Then I added the melted butter, vanilla, vinegar and red food colouring. 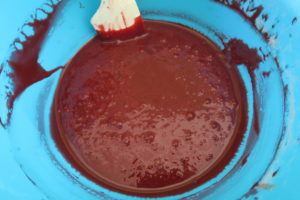 Lastly I whisked in the flour, cocoa powder and salt. 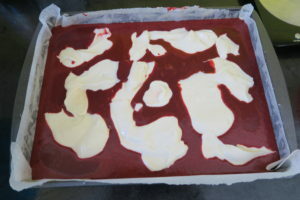 I poured the brownie batter into the lined tin, added the cheesecake mixture in blobs on top, then used a butter knife to swirl the mixture together. 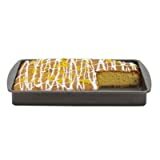 It baked for 30 minutes, then I left it to cool completely before slicing up. 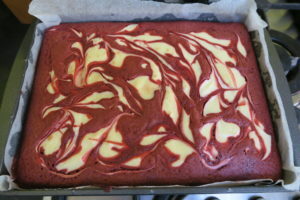 The Red Velvet Cheesecake Brownies looked so pretty and colourful! 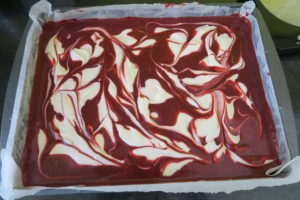 The white cheesecake swirl against the red brownie is so striking. They’re also super moist and fudgey – just what you want from a brownie! And the cheesecake is so creamy and absolutely scrumptious. They won’t last long! 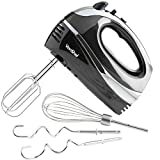 You can find more of my Brownie recipes by clicking here! Love-love-love! I'm making these for my 3 little people!